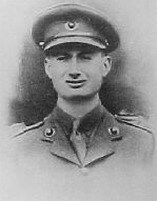 LIEUTENANT H.D. HARTNOLL DSC ROYAL MARINES. During an enemy attack on H.M.S. Coventry, an incendiary machine-gun bullet hit the after-ready-use ammunition locker, setting one of the charges on fire. Lieutenant Hartnoll jumped down from his action station on No. 8 gun deck, lifted the loaded, hot cylinders, and threw them overboard.